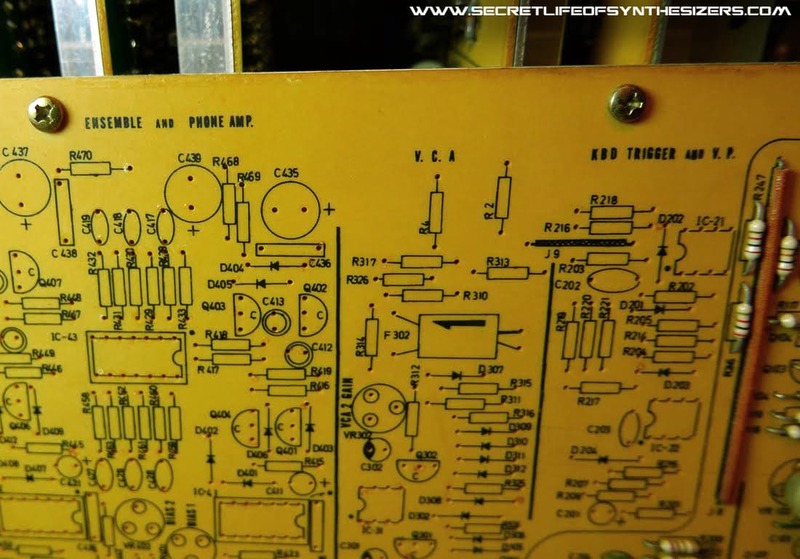 Inside the legendary Korg PS-3300 polyphonic synthesizer. 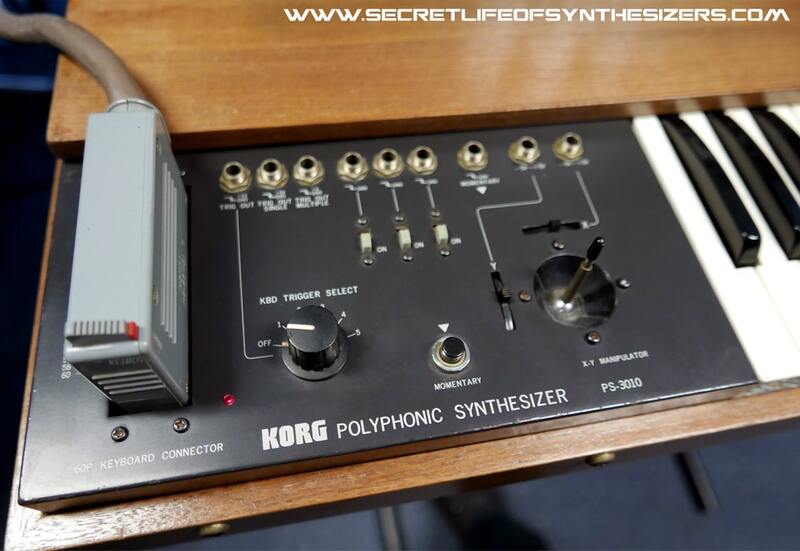 Before the famous Korg MS-series there were three large polyphonic synthesizers released by Korg. 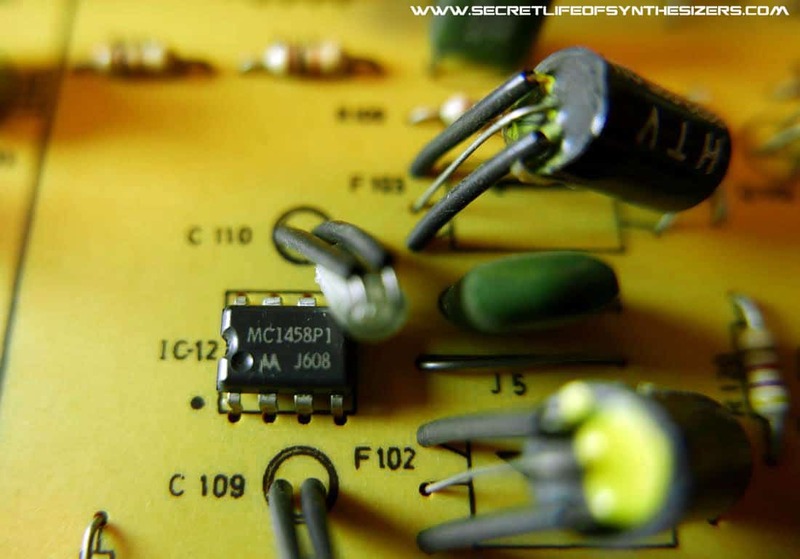 They were unique to this day in that they were true polysynths because they have individual VCF’s, envelope generators and VCA’s for every key. They were designated the PS-3100, PS-3200 and PS-3300. The king of them all was the very rare PS-3300 which is a semi-modular synth with three complete and independant polysynths in one cabinet. The PS-3300 is probably not a synth that most people will ever get a chance to play, estimates of the number built seem to vary between 20 and 50. 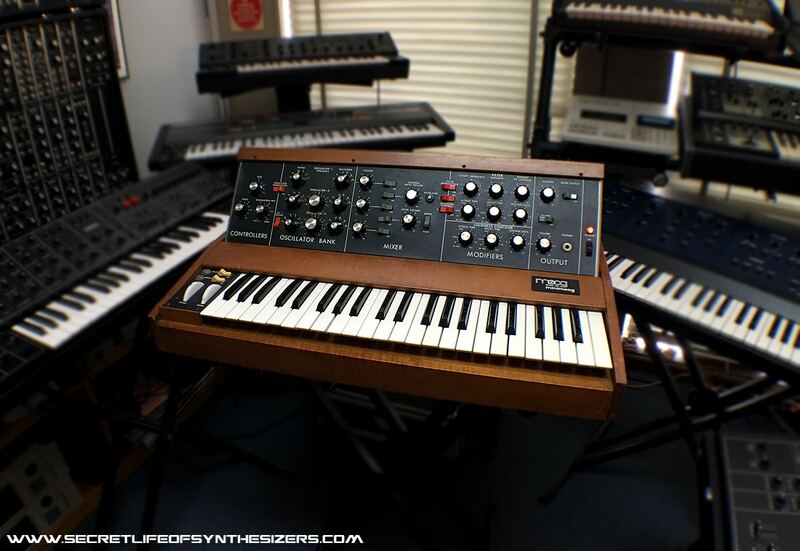 It is an imposing machine in a beautiful wooden cabinet and a matching keyboard connected by a thick cable and two massive Honda connectors. 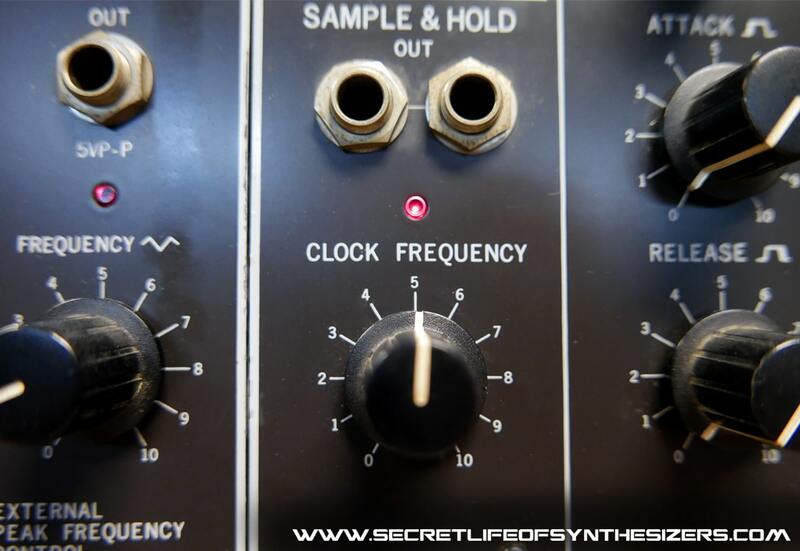 It has a distinct and etherial sound that is partly a result of the unusual triple resonators in each synth block – three sweepable band pass filters that can be modulated by an LFO. It’s panels have a family resemblance with the later MS series mono synths and it shares the same VCF’s with them. 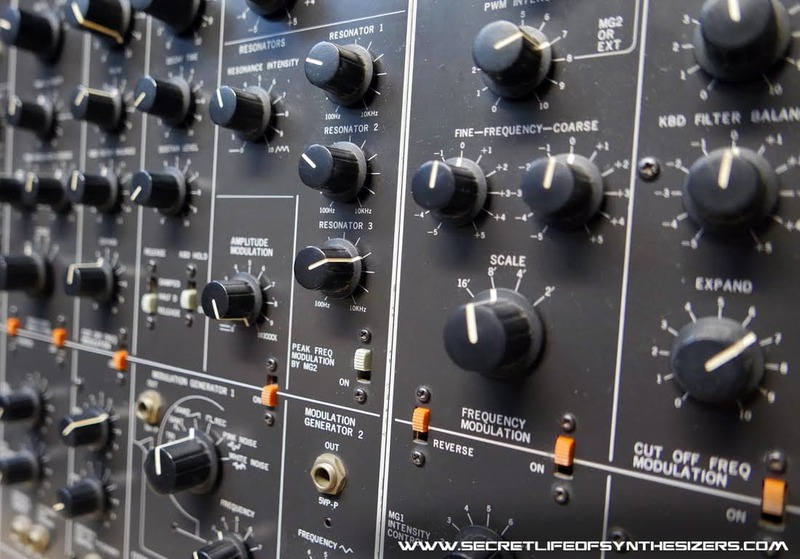 The family resemblance between the PS and later MS series synths are clear, the knob profile and panel graphics on this version of the PS-3300 are close to identical. The panel colour and the use of small slide switches are the only significant style differences. This is one of the later versions of the PS-3300, earlier models has metal skirts at the bottom of each knob. The panel layout is clear and easy to follow for the most part. 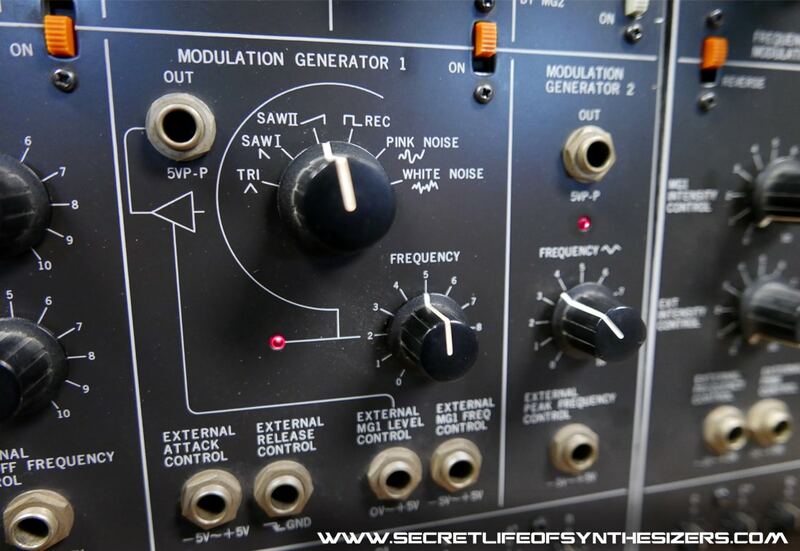 For those used to the MS series there are some controls that will be unfamiliar, the envelopes on the PS series synths are unique and idiosyncratic and are the weakest point in the machine with the release time being selected by a three position slide switch that operates in conjunction with the sustain level and decay controls. The PS-3300 has plenty of modulation routing possibilities using the front panel jacks, Korg made excellent choices when deciding where to install jack points – they are far superior to the MS series patch layout. Being semi-modular however the synth can be used without any patch leads at all. The 1/4 inch jacks are robust and overall the build quality is very solid. 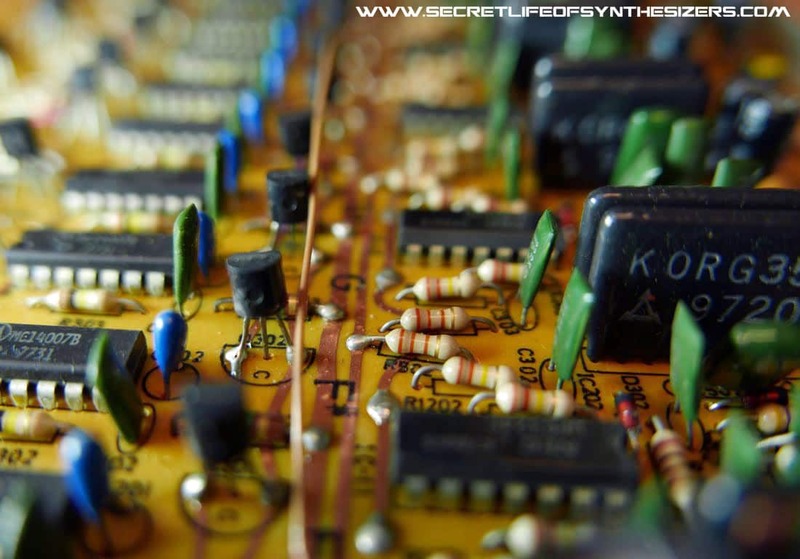 The PS-3300’s electronics are on circuit boards that load vertically into a large card frame that spans the entire width of the synth’s interior. On the LHS (seen from the rear) is the power supply. 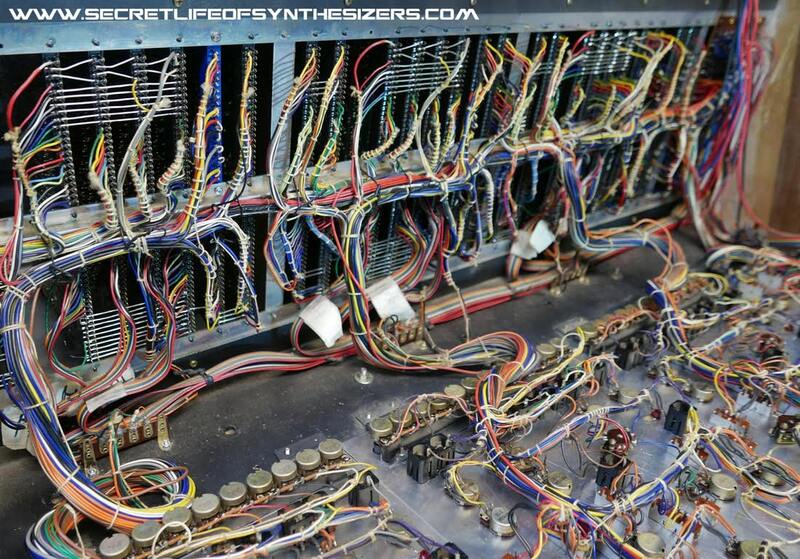 There are three identical sets of 8 cards, one set for each of the three synth modules. The third group includes two extra cards that hold the circuits for the master and output section. Servicing is relatively easy, even though the cards are racked close together and it can be tricky to probe between them the circuits are well laid out on single sided boards and most faults that may develop can be easily traced, the circuits are straightforward and a little time spent with the schematic diagram will reveal the likely component that had failed. the circuits are so simple and elegant they don’t tend to develop tricky problems. 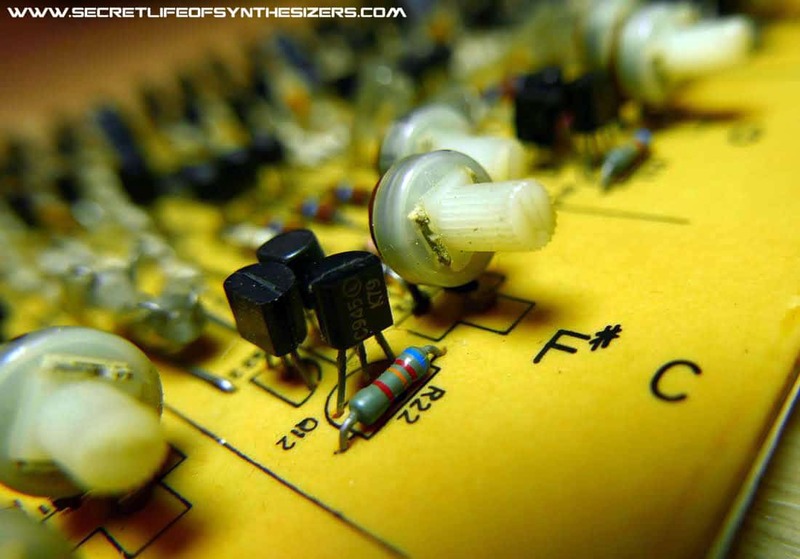 The most common failures, as with most old synths are 4000 series CMOS IC’s and capacitors. 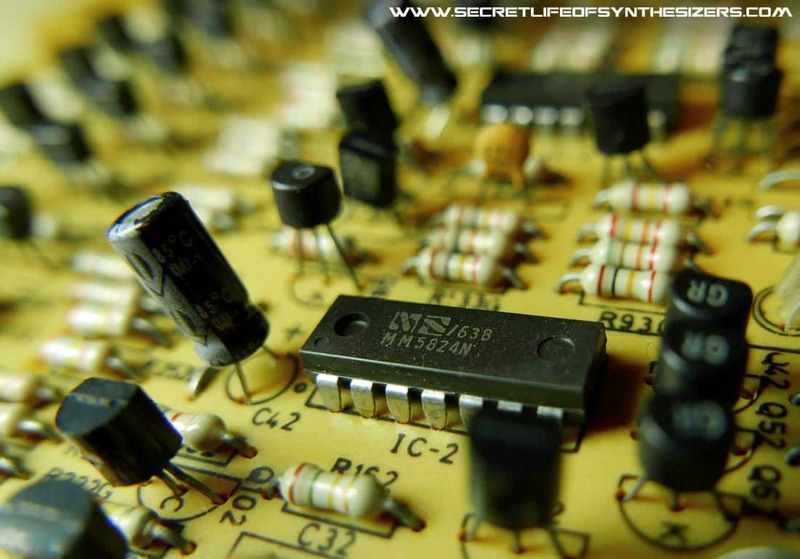 Each of the three synth modules consists of two tone generator boards that produce the raw waveforms for the oscillators. Each board produces a half octave of notes for the top octave of the keyboard that are then successively divided down to cover all of the other octaves. There are four Gate boards that each have 12 Korg 35 filters on board plus envelope and gate circuits to give each key it’s own synth channel. The two remaining boards handle LFO’s, noise, resonators, balance mixer, filter and envelope control functions. The LFO’S are notable on the 3300, particularly the powerful LFO 1 on each module which has a very wide frequency range and a good selection of waveforms. The final two cards are the circuits for the master section. One of the cards is partially un-populated with components for the Ensemble circuit found in the smaller PS-3100. Why Korg left this empty is anyone’s guess, perhaps it was lack of front panel real estate for the controls and jacks. As mentioned earlier he PS-3300 is a relatively simple machine to service and diagnose, like a mixing console there is a modest amount of circuitry with a lot of duplication. 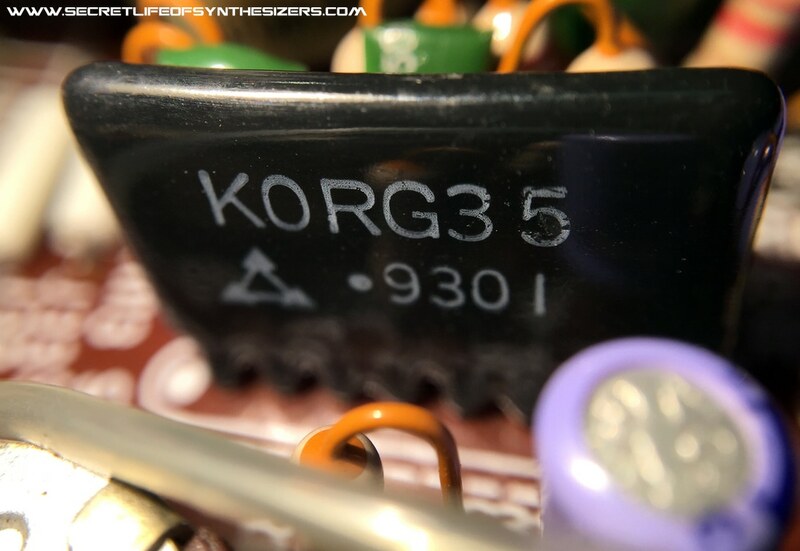 Most of it’s electronic components are still available, the Korg 35 filter modules are really the only parts that are rare and these are simple and reliable and so rarely fail. 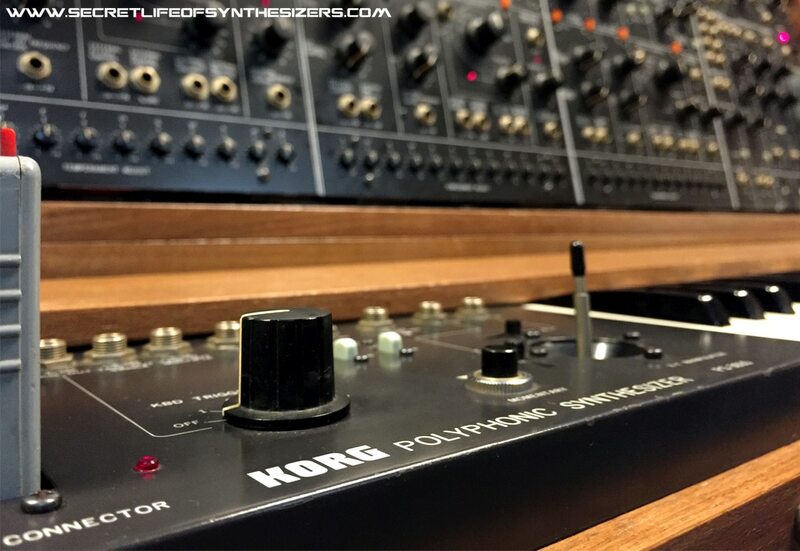 The 144 Korg 35 filters within the PS-3300 are identical to those in the MS series synth but the surrounding circuitry is different – The resonance control on the filters will not drive them into self-oscillation. For that reason the 3300 is a gentle sounding synth that isn’t capable of the kind of wild sound that MS series is known for. It is quite ethereal sounding and it’s especially good for for swirling pad sounds. 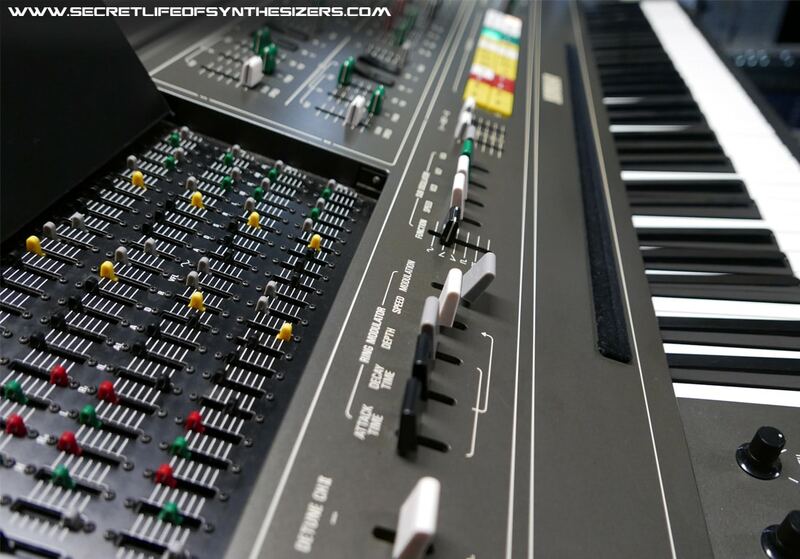 As there are three separate synths in parallel it can produce a layered sound that is very distinctive. 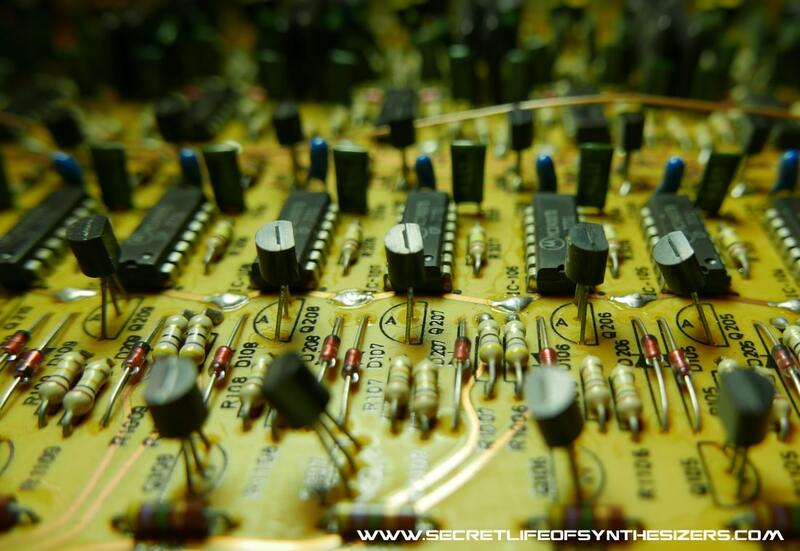 The filters live on the gate boards, there are 12 of these boards on the synth for a total of 144 synth channels with 144 Korg 35 VCF’s. 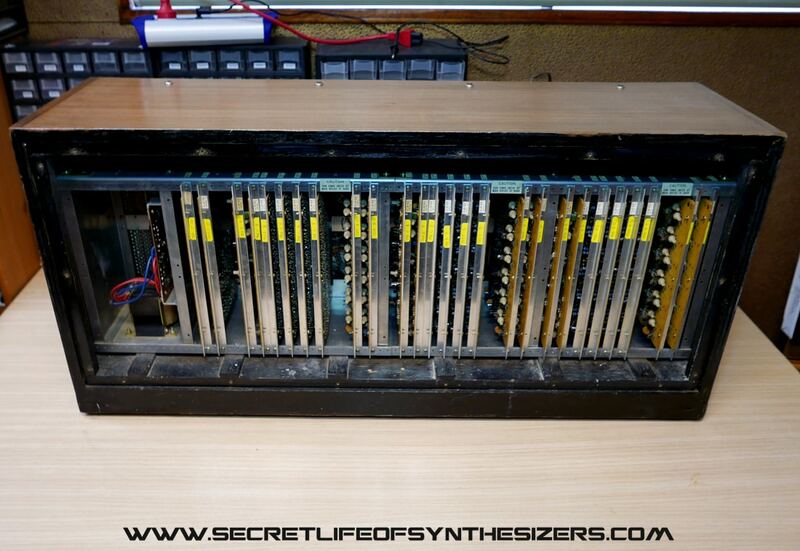 The front panel of the synth is divided into four sections – One for each synth module and a master section. The controls are hand wired together and the rear of the card cage is visible in the image. 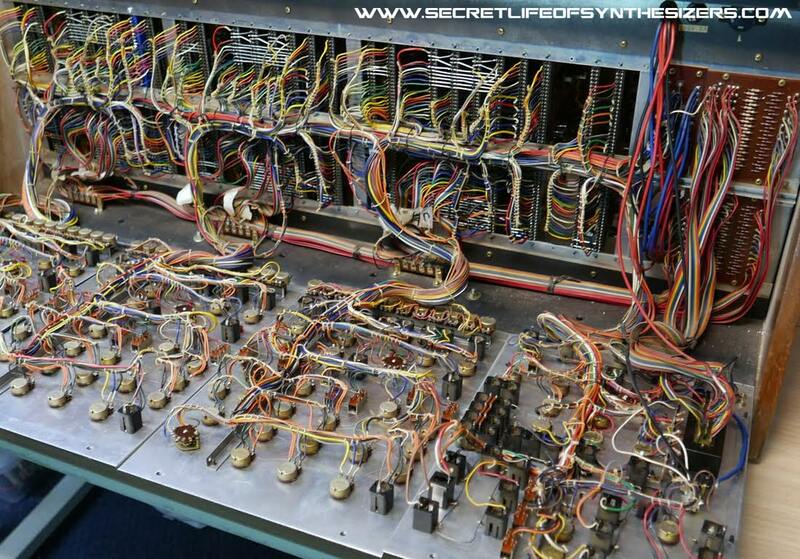 There is a lot of wiring, one of the reasons for the high cost of the instrument when it was released. Like many Japanese synths of the period the mechanical design and construction was well thought out and makes for good service access. Note the rows of 12 pots at the bottom of each panel – these allow each note in the synth module to be shifted up or down in order to allow the musician to use microtonal tuning – with them you can create new scales or set traditional non-chromatic scales. A left over from the PS3100? The Korg PS-3300 is, like the Yamaha CS-80 rare and difficult to find. You are more likely to come across the smaller PS3100 and PS-3200 which are more common and share the same issues. The main problems to look for in the PS series are leaking electrolytic capacitors and cracked card sockets. The other issue is aged RCA 4000 series CMOS IC’s. Failed 2SK30A FETs are also common. 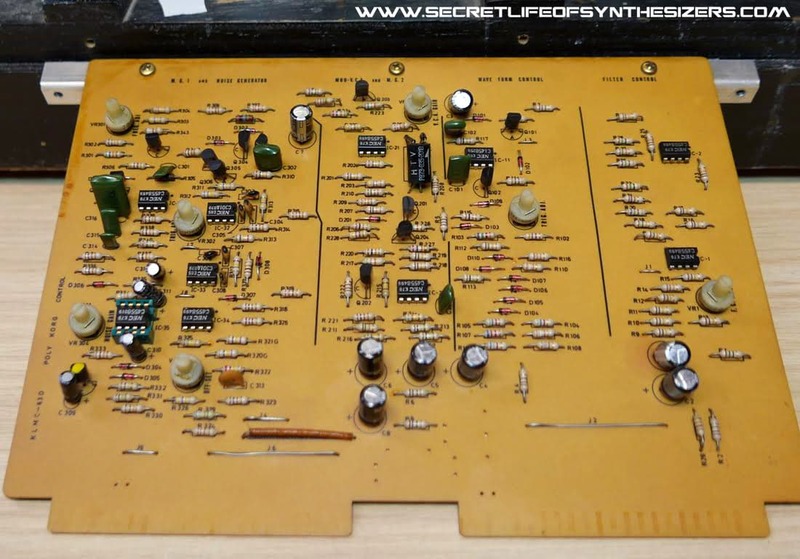 If you buy a PS series synth in an un-restored state it is a straightforward job to replace the electrolytic capacitors and all of the 4007 CMOS IC’s on the gate boards. The parts are still available and inexpensive. 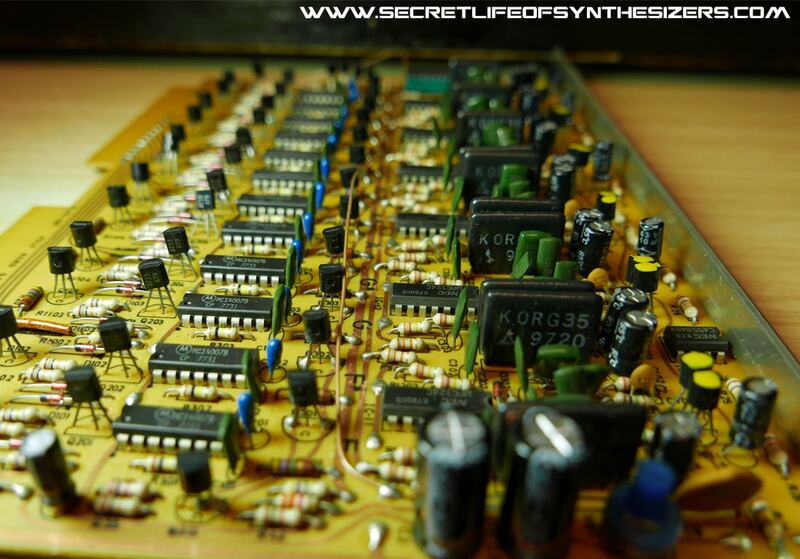 The Korg 35 filters seem to rarely have a problem and the divider IC’s which are obsolete have been replicated by a British company and are easily replaced if one should fail. The card sockets are fragile and prone to cracking so care should be used when removing and inserting them. 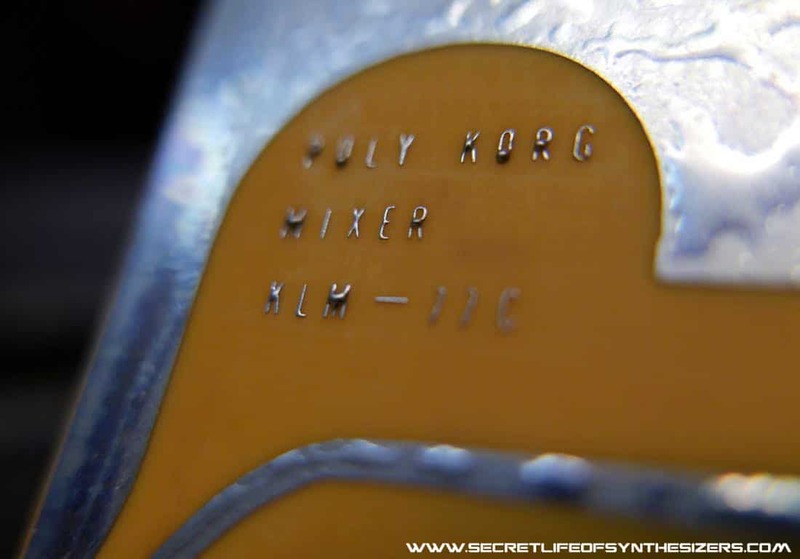 Many PS-series synths have had their card sockets replaced over the years. Aside from the VCF’s and dividers most parts in the PS series are easily found. 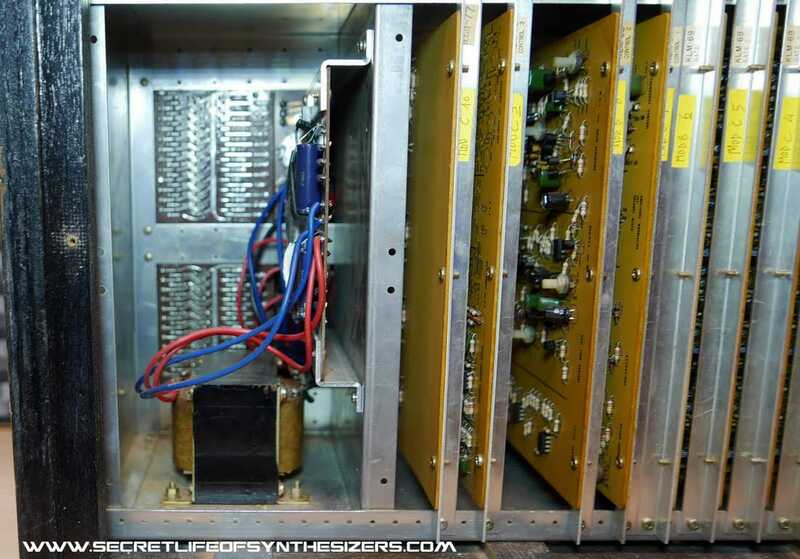 The story of the Korg 35 VCF module in pictures. 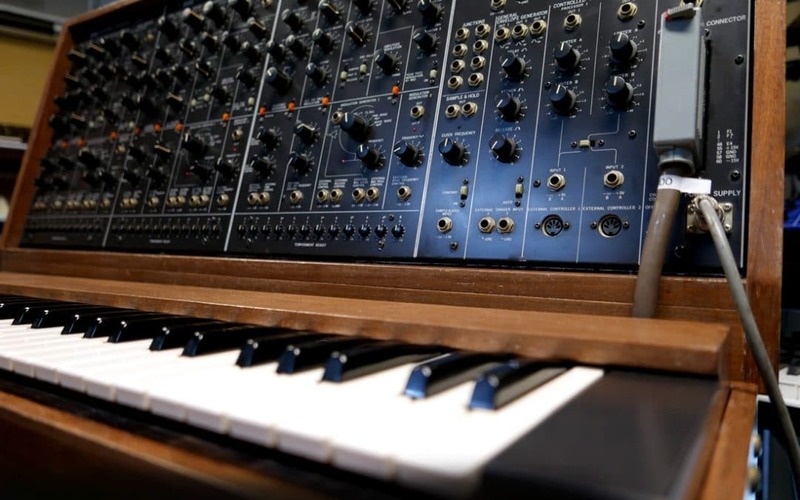 Inside Moog’s Minimoog Model D. A photographic journey. A tour inside the mighty Yamaha CS-80 1970’s poly synth.